On the internet it is easy to hide behind your monitor and keyboard and be a jerk to people. But I thought that being a photographer I was part of a better group of people since we have to stand up to ourselves so often and we stand united together. Today I saw something that made me change my mind in regards to that though.. I am a Sony shooter and I tend to spend some time online in Sony groups, talking about new Sony gear, lens reviews and all around assistance regarding Sony newcomers and such. Up to now it has been a quite joyful experience. Being a Sony shooter means that I’ve been part of a smaller community than Canon or Nikon have, and that means a lot of the time that I have to defend my or other users choice of using Sony gear. But what I cannot understand is people within the community being nasty to one another. And that is what I saw. 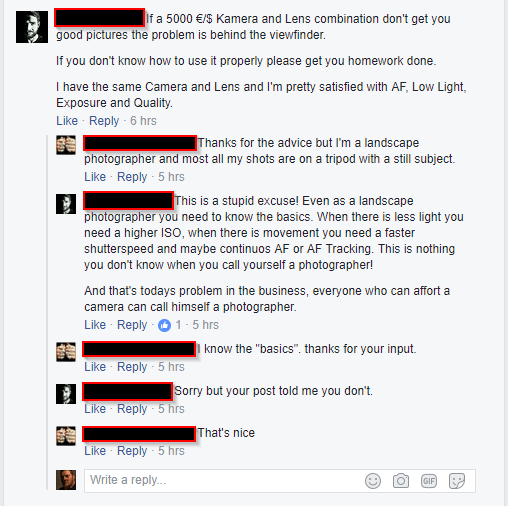 As you can see on the screenshot here above (I’ve taken the names out of all screenshots) there is a person asking advice about how to use his/her gear in low light, there is nothing in this post that says he/she is a professional nor that this is for paid gigs, but look at the answers here below..
Now this is something I don’t like.. The attitude and aggression this person answers in is beyond what I’ve come to expect from people. I must note that neither of these people is me nor do I know them at all, but this just makes me angry. Yes the poster has an expensive camera and lens, yes that’s the kind of gear that you’d expect a pro to be using but it can ALSO be from a novice or someone who is simply learning, you don’t know the background that people come from. Some people have more money than others and have a better start in life.. such is life! Why am I writing this? Well, for one, I’m fed up with people like this, I try to be the best person I can at any given time. I try to give advice to the things I know about and shut up about the things I don’t know about. But I am just one man. I think we all deserve to be treated nice, to not be ambushed when posting a simple question on the internet. But maybe that’s just me? Bottom line, don’t be a jerk on the internet ok?